GALION — The Galion High School Class of 1967 had its 50th reunion on Sept. 29-30. About 60 classmates and friends gathered Sept. 29 at Pizza Hut in Galion. The Ontario Event Center was the scene for Saturday’s reunion, where 103 classmates and guests were greeted by Rosie Champion Faulds and Charlene Neff Wilkinson. There was a social hour, followed by a class photo taken by photographer Don Faulds. The class photo will be available for download by those who have provided their email addresses. Before dinner, Steve Kump introduced a special showing of a Galion High Class of 1967 DVD. It was compiled using yearbook photos, as well as photos submitted by class members. Also included were pictures of memorabilia, Galion history and important world events of that time period. All were set to the songs of the 1960s. The DVD was created by Steve Kump with help from Ingemar Svala. A copy of the DVD was given to each classmate, and is available for purchase for those unable to attend. The blessing was given by Ted McCleese. During the buffet dinner, Barney Musselman entertained attendees with a collection of jokes and readings. A business meeting followed, directed by Deb Dougherty Metzger. Items discussed included a vote to continue having reunions and the decision to contribute to the Galion Schools Foundation scholarship fund. Mini-reunions — organized by Ingemar Svala — will continue. Committee chairman Ingemar Svala, and members Steve Kump, Paulette Volk Frederick, Judy Cook Lawrence, Rosie Champion Faulds, Charlene Neff Wilkinson, Marsha McCracken Cheesman, Deb Dougherty Metzger, Barney Musselman, Andrea Armrose, and Becky Wallace Napier were commended for their efforts to make the events a success. A collection of photos of 41 deceased classmates was on display. It was created by Rosie Faulds. Sherry Barr Ryan donated two afghans which, along with some other tiger memorabilia, were raffled, with tickets sold by Dan Phillips. Proceeds of the raffle will be added to the scholarship donation. Class members were encouraged to keep in contact with Ingemar Svala, reporting any address, phone and e-mail changes. A list of 30 missing classmates was displayed with requests for those present to provide information. The remainder of the evening was spent socializing, renewing old friendships and creating some new ones. Photo courtesy Don Faulds Galion High School’s Class of 1967 had it’s 50th reunion in September. The class and guest met at Galion Pizza Hut on a Friday evening and the actual reunion was the next evening at the Ontario Event Center. https://www.galioninquirer.com/wp-content/uploads/sites/38/2017/11/web1_IMG_1366.jpgPhoto courtesy Don Faulds Galion High School’s Class of 1967 had it’s 50th reunion in September. The class and guest met at Galion Pizza Hut on a Friday evening and the actual reunion was the next evening at the Ontario Event Center. 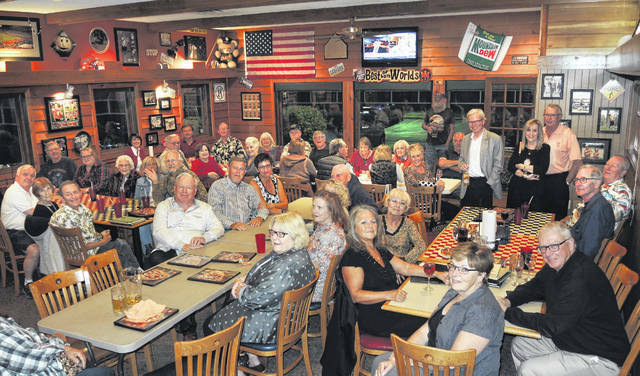 More than 40 members and guests of the Galion High School Class of 1967 met in September at Galion Pizza Hut. The next evening, more than 100 attended the reunion at the Ontario Event Center. Information for this article was submitted by members of the GHS Class of 1967.